The greatest fear we all have is of death. Who would disagree? In fact all fear is based on some kind of loss. We lose our security, our loved ones, our job, our lives. They all seem to be related. And another part of our fear of death relates to what will happen to us. Is there something else after this life is over? Are we off to heaven? Are we off to hell? These thoughts certainly are present, especially as we get older. And the more we are attached to our bodies, the more we fear losing it. It is our primary identity after all. It's who we are. Deep down our fear of death is based on the fact that we think we are a body having a human experience. If we lose our bodies we lose ourselves. We lose our very essence — who we are. At least that is what many of us think. But what if we weren't really our bodies? What if we were spirits and souls merely having a tempo ray human experience? What if our spirits did not die and we went on forever in some other form? What if we were much more than just a body? I guess those thoughts are the basis for many religions. The possibility of an "after life," and something good happening after we die is very appealing. We can't help but be attracted to this possibility, and any religion that offers this option is bound to be appealing. 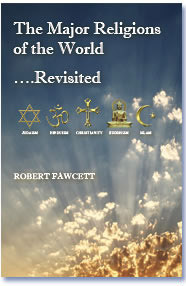 Further, this book makes it simple: it ask the same questions of each religion as to its beliefs and teachings. The origin of humankind? The origin of evil and suffering?